She did, beginning in 2005 just as Arabic instruction was introduced at Swarthmore. By graduation, Gund had undertaken summer research in Morocco, written an honors paper in Arabic, and been examined in the language as part of her special major in languages and linguistics. Gund has been at the forefront of Arabic language study, which has registered the largest percentage growth among languages taught at U.S. colleges and universities between 2006 and 2009 (46.3 percent) and now ranks eighth in the nation among languages taught, according to the Modern Language Association. Interest in Arabic has also soared at Swarthmore, in part because it is an integral component of the Islamic studies minor approved in 2008. Today, the College’s Arabic program includes four years of language study as well as options for directed readings and conversation. 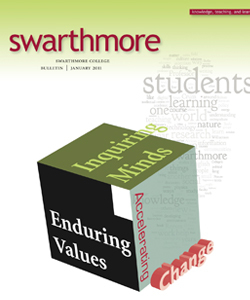 More than 100 Swarthmore students have enrolled since it was introduced. Graduate study is another popular option. Jane Abell ’11, who has studied in Syria and taken every course in Arabic offered at Swarthmore, is both an honors sociology/ anthropology major and an honors minor and course special major in Islamic studies. After graduation, she hopes to take a break from academia to work in a position where she can use her language skills and knowledge of the Middle East. Among the Arabic program’s success stories are three Fulbright winners, including Gund. All used their grants to work in the Middle East after graduation: Gregory Jehle ’08 in Syria, Mara Revkin ’09 in Oman, and Gund in Morocco, where she researched language in the classroom. Today, she is pursuing certification in elementary education at the University of Pennsylvania. Of the seven modern languages taught at Swarthmore, Arabic is the only one without a tenured or tenure-track faculty member, leaving the program at a considerable disadvantage. Retention of faculty is one concern. “Without a tenure-track position, we face real challenges when we try to hire faculty in a market that is very competitive for well-qualified candidates,” says Provost Connie Hungerford. Continuity is another issue. A dedicated, tenurable position, Hungerford says, would provide the leadership needed to oversee the teaching team, advise students, and teach independent study classes to advanced students. “We owe our students a coherent and stable program, with the best teachers we can find,” she says. Adding a tenure-track position will increase the programs’ costs. Raising $1 million in endowed funds will add approximately $40,000 to Arabic’s budget at an average endowment spending rate of 4 percent. Swarthmore is working hard to raise the necessary funding, Chopp says.